The farmhouse is set on a south-facing hillside and enjoys spectacular views over un-spoilt countryside down to the sea. Set on 4 acres of grounds and gardens, this charming farmhouse, dating from 1916 is very well furnished in an antique, rustic style and it is just a few minutes drive from the town of Estoi. The Eastern Algarve is still unspoilt and relatively underdeveloped offering a more relaxed atmosphere for those wishing to escape the bustle of the main tourist areas while still having access to glorious beaches frequented more by the locals. Fascinating historic town of Faro within easy reach, and the historic town of Loule, famous throughout the Algarve for its many craft shops and markets. The pretty fishing village of Olhao is 8 kms away. Ideally situated between the east and west Algarve golf courses. Spain is easily reached within 40-45 minutes. Main House: The main house is divided into two distinct self contained living spaces each having their own kitchen, bedrooms and bathroom. Wood cabin: There is a self-contained wood cabin on the property that sleeps 2-4 which is included in the rental when the party is larger than 8. It has one bed, bathroom and living area with convertible bed and small kitchen. Enjoyed the pool. The view is great. The setting is beautiful. The Estoi area Has many good restaurants. The property is central to the Algarve and close to the Autoroute, which gives easy access to most places in the Algarve. We stayed before and loved it. There are a couple of downsides. There is no air conditioning. There are a lot of ants. You can't leave bread on the counter long enough to make toast without your bread getting full of ants. Our family stayed at the wonderful farmhouse for four nights. We loved the rustic environment. Having dinner outside under the stars was magical. The children played in the pool and walked around the grounds looking for wildflowers and bunnies. We took day trips to Lagos to see the cliffs and grottos, Olhao for a boat trip to the sandbar islands, and strolls through the palace, the Roman ruins, and Estoi’s plaza. The little red farmhouse is a very special place to stay. We thank Victor and Laura for your hospitality and highly recommend a stay at their home. We had a lovely few days, very quiet and lovely place for a relaxing break away from it all. My husband and I stayed and Victor and Laura's Alcaria Branca for almost 6 weeks during February and March. Our plan was to escape the worst of the Canadian winter in the sunny Algarve. Unfortunately, the weather didn't cooperate and it was cold, rainy and windy for most of our stay. This didn't stop us from exploring, though, and every day we did day trips throughout the Algarve. Alcaria Branca is situated within about an hour's driving distance of some of the highlights of the area, and within about 2 hours you can be in Seville, Spain (not to be missed) or into the rolling hills of the Alentejo. The house itself was clean and the property manager, Vitor, was beyond great. Due to the weather we had to make full use of the heating sources (pellet stove, fireplace and portable propane heater) and he was there to maintain, stock and ensure our comfort. He checked in on us from time to time and he was always just a phone call away. The separate apartment (our daughter and son-in-law stayed there for a week) was charming and perfectly self-contained. We didn't use the swimming pool, but it's a lovely tiled pool that would be a godsend in the warmer months. The only reason this home didn't get a 5-star rating is that we found the bed a bit uncomfortable. This may be a personal preference, but both my husband and I found the bed in the master very hard. A memory foam topper would have made it perfect. 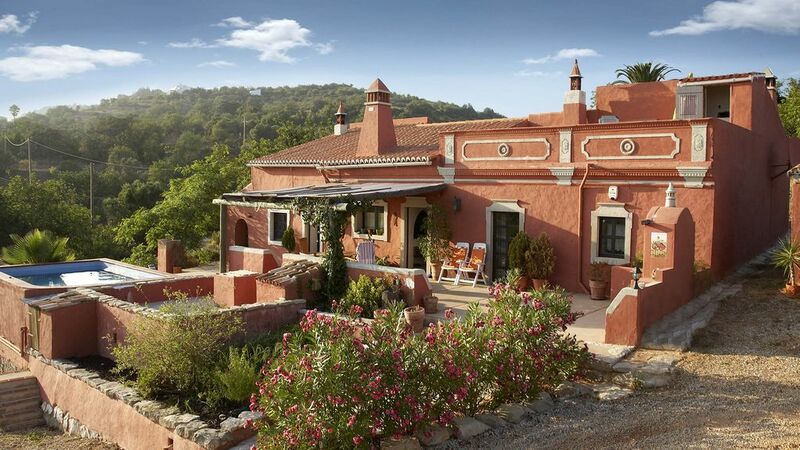 Overall, this is a lovely home situated in farmland amongst orange and olive groves. And we thank the owners very much for a lovely stay. We stayed for 10 days in January 2018. Loved the location. The place is well equipped with all you need. It is a restored farmhouse of the area with charming vintage and antique qualities. Even though only 2 of us stayed here it would accommodate more. Enjoyed having breakfast in the warm sunshine looking down to the sea. When going to Portugal in January, many places are not insulated or heated. It gets cool at night. This farmhouse has a wood fireplace and a pellet stove and a portable gas heater. Otherwise we enjoyed our stay there. Excellent place to stay and relax! This farmhouse was top quality in every sense of the word from its serene and quiet peaceful location to the beautiful light and airy interior with amazing furnishings.There was no amenity we couldn’t find, and the information left by other guests was also helpful for traveling to nearby sites and restaurants. The bonus for our family was a most adorable old dog who would visit regularly but not so much as a bark. Just loveable and friendly. We can’t recommend this lovely home enough. We definitely wish to return next Fall.